See the John Day Lock and Dam, Lake Umatilla website for additional information. Primary recreational opportunities are listed below. Directions: From The Dalles, 25 miles east on I-84. Factoid: John Day Dam is 216 miles upstream from the mouth of the Columbia River and located at Exit 109 off Interstate 84 in Oregon. The project consists of a navigation lock, spillway, smolt monitoring facility, powerhouse and fish-passage facilities on both shores. 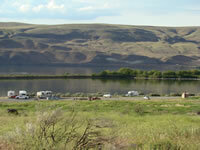 Many recreation opportunities are available along the shores of Lake Umatilla and on the John Day River, such as boating, fishing, swimming and sail boarding.